"Mahalaya marks the beginning of Navratri and Durga Puja." "It is the end of Pitra Paksha and the beginning of the Devi Paksha." "Mahalaya is the last day of the Pitra Paksha or the period when Hindus remember and offer homage to their deceased ancestors." "It is the beginning of Durga Puja festival which is the major festival of Bengal." But for me, it meant waking up at 4:30 in the morning. Sleepily going to my grandparent's room where Birendra Krishna Bhadra's mystical chants of "Chandi Kavya", playing on the radio, had already filled the room. His booming voice and rhythmic chants still gives me goosebumps. Half sleeping - half awake, I used to eagerly wait for the "Chandi path" to end, so that I could switch on the TV and watch the "Mahishasur Mordini" pala, which followed. Back then, watching the enacted drama on TV was far more appealing than listing to chants (whose meaning I never fully understood) on the radio. And now, I often play the "Chandi Path" on YouTube, even if its not Mahalaya. How time changes you! Apart from the morning ritual, Mahalaya also meant the beginning of the "Puja Vacations" in school and "Luchi - Cholar Dal - Jilipi" for breakfast; "Pulao - Fish Fry - Kosha Mangsho" for lunch and "Kebabs - Roomali Roti - Chicken Chaap - Phirni" for dinner. While the entire country turns Vegetarian for Navratri, which starts form Mahalaya, we Bengalis turn Gluttons. May be 'gluttony' is a strong word but I cannot deny the fact that the days of Durga Puja means unlimited fun and unlimited good food. Vegetables, meat, fish, eggs, sweets; we have it all. Since my late teens, I have been suffering from a digestive disorder, which prohibits me from having a foods that have a high fat content. This means very limited choices while dining out. The only things I could eat freely were broth based Soups from the Chinese restaurants and the mouth watering Kebabs, which are cooked without any additional fat. Thus started my love affair with Soups and Kebabs that grows stronger with every passing day! What better way to celebrate the special day of Mahalaya, but to post a refreshingly fresh and delicately flavored Tangi Kebab. I will ignore the fact that I made these Kebabs on a hot and sultry day, without any though of Mahalaya in my mind. Now "Tangri" or "Taang" is Hindi for leg. "Tangri Kebabs" are mostly made with chicken. Loosely translated, "Tangri Kebab" means Chicken Drumstick Kebabs. This is perhaps the easiest kebabs of all. You marinate the chicken drumsticks with spices overnight, grill it on your gas grill/charcoal grill or Tandoor and your kebabs are ready. Really, that simple! What you marinate your chicken with, is what determines the flavor of your final dish. Yogurt is a main ingredient in all marinade. It tenderizes the meat and speeds up the cooking time on grill. This "chutney flavor" kebabs were made on a whim. My mint leaves were wilting and about to turn black and the only way to save them, were to puree them. I had marinated lamb chops in green chutney on our camping trip to Hocking Hills last summer. And today seemed the perfect day to try repeating the same, but with drumsticks. You put a cilantro, mint, ginger, garlic, green chilies in the food processor/blender and make a coarse paste. Add salt and yogurt and your marinade is ready. 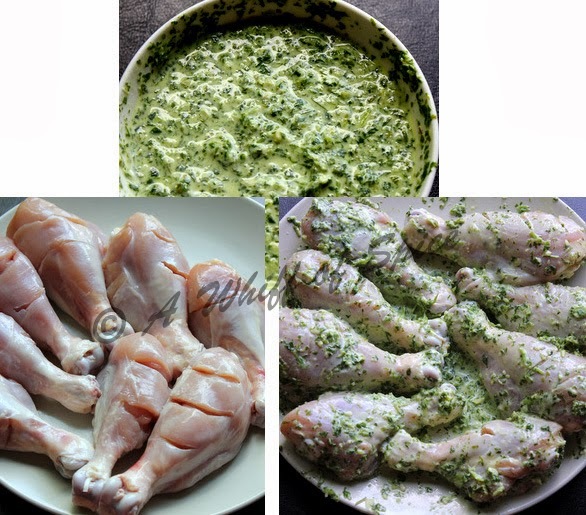 Wash, dry and score the chicken drumsticks and slobber in the marinate from 8 hrs till 24 hrs. Prepare your grill. Gas grill/ charcoal grill/ tandoor/ and even the 'Broil' mode in your oven suits fine. If using an outdoor grill, flip every 6-8 mins for 15 to 20 mins till done. Now, I do not own any kind of grill. So the only option is the oven. It makes perfect kebabs but the smoky flavor of the charcoal is definitely missing. To make perfect Tangri Kebabs, Do Not BAKE. It toughens the meat. Preheat your oven on "Broil" mode.Wrap a cookie sheet with heavy duty aluminium foil or double wrap it. Grease it lightly. Place a cooling rack over it and grease it too. Now place your drumstick on the cooling rack and put it on the top rack of the oven. Broil for 10 mins. Take it out. Flip it and place it back for 8-10 mins. Now every 5-6 mins, take it out and flip it, till done. They come out perfect every time and the meat remains juicy and succulent. It might be a little laborious and you have to be on your toes, but it takes maximum 20 mins to get that perfect tan color. Do not forget to flip every 5-6 mins. Or else you'll be left with charred meat on one side and under cooked meat on the other. Once the drumsticks are out of the oven squeeze lime juice on it. You might want to add a little chaat masala. Serve it with onion rings and green chilies. Usually Tangri Kebabs are served with Yogurt based Green Chutney. But since the chutney flavor is already in the drumstick, I decided to do with simple Onion Salad. Onions are sliced into thin rings and soaked in lemon juice to get rid of the acrid flavor. 1. Wash and pat dry the chicken drumsticks. Make 3 slits on each side so the the marinates reaches to the inner most flesh. lightly season the drumsticks. 2. In a food processor or blender dump, a bunch of cilantro/coriander leaves, few sprigs of mint , ginger, garlic, green chilies (all roughly chopped) and blend it into a paste... It need not be a smooth one. 3. Add the salt and the yogurt to the cilantro-mint paste and mix well. 4. 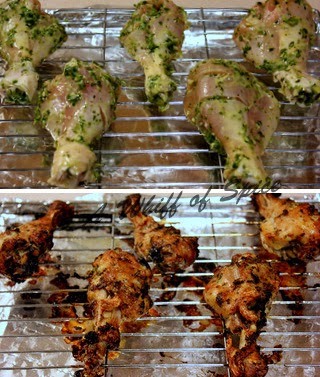 Slobber the chicken drumstick in the cilantro-mint marinade. Pour everything in a Ziploc back and squish it around. Works well for me! Leave it in the fridge for 8 hrs to 24 hrs. 5. If using a outdoor gas or charcoal grill, prep it up. Once the desired temperature is reached, place the marinated drumsticks on it. Shake off the excess marinade before placing on the grill. Flip every 7-8 mins till the chicken is cooked through and the skin has a nice bronzed color. 6. If using your regular oven, preheat the oven on 'Broil" mode. Line a cookie sheet or a baking tray with aluminium foil. Use a heavy duly one or double line it. Grease it slightly. Place a cooling rack over the baking sheet and grease it too. Place the drumstick over the cooling rack and place it in the broiler. After 10 mins take it out. Flip it and put it back for another 8-10 minutes. After that, keep flipping the drumsticks every 5 mins till the chicken is cooked through and the skin has a nice bronzed color. 7. Once they are done, squeeze some lemon/lime juice on the drumstick and sprinkle a little Chaat Masala (optional). 8. Serve hot with onion rings in lemon juice and green chilies. 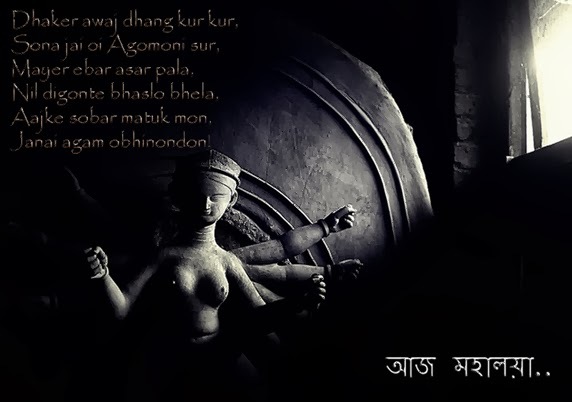 Happy Mahalaya to everyone. And if any of you have missed the "Chandi Path" this morning, here is a YouTube version. It is playing on my laptop as I type this post! lovely recipe Progna. came to check it as my son loves snacking on such tangy chicken kebab. will try to make it during pujo. I love this way of making drumsticks but I do without the Yogurt. Infact I have a blog post ready which I need to publish now your post has inspired me.